It was a late Sunday afternoon when my friend decided to tag me along to Ortigas Home Depot. He wanted to check out some materials for the construction of his condominium. Eager I was to go out and see what new things I can discover, I hurriedly gave in to the invitation. As I was strolling, my eyes caught on the products of a door hardware distributor called Doortech System. Their stall carries different types of automated garage doors, sliding and swing gate operators, roll-up shutters and grilles, as well as gate barriers among others. Apparently, the automated gates we see in movies are made possible through gate operators. Basically, existing bi-folding, swing or sliding gates can be installed with electro-mechanical motors in order to open them automatically through remote control. Lastly, it helps a driver to stay dry and worry-free during the rainy season, since he no long has to alight from the vehicle to open the gate manually. Talk about what’s new with gate operators, the personnel mentioned that selected gate operator models, such as their Italian brand RIB, also have a Wi-Fi version. Oh great! Just like Internet Wi-Fi? In principle, yes. Usually, gate operator installation typically requires masonry work on the support columns of gates. The marble or stone columns have to be drilled in order to provide the necessary electrical wiring provision. With the Wi-Fi gate operators, it eliminates the wiring needed to connect the different gate operator components, thereby also eliminating the need for drilling. All parts of the gate controller are controlled by radio signals emitted by the central master unit. In terms of security, there’s no need to worry about hitting something or someone. Gate operators are packaged with safety sensors. The gate automatically stops the operation, either opening or closing, in case an object suddenly passes through. This security feature is very important when another car or a person suddenly blocks the way of the opening. Now that’s wise! Although it is easy to install gate operators to existing gates, I was advised that the best time to invest in a gate operator unit is during the structural phase of the construction. By doing so, the engineers can advise the necessary provisions in advance before the gate is even mounted. 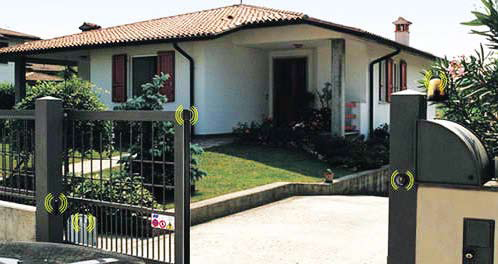 Whether you have a small or big gate, a light or heavy one, gate operators are able to support various weights. It can handle gate leaf weights ranging from 200 to 2,200 kilograms. Be ready to spend about Php35,000 and above depending on the engineer’s assessment. Now I wonder how come not so many houses in Manila have gate operators. Is it because they don’t know about it or they think it’s too expensive? I surely want one! How about you? This article is my 55th contribution to Manila Bulletin -- one of the Philippines' leading broadsheets -- published on January 30, 2012 (Monday) in the TechNews Section. You can view the PDF version here (upper center portion).